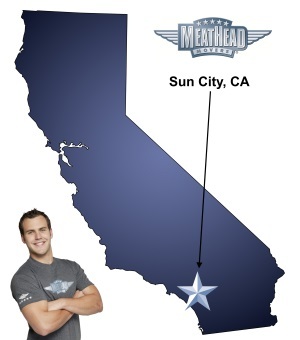 For a trouble-free move to Sun City, Meathead Movers is the company for you! Our professionally trained student-athlete movers are ready to get you into your new Sun City home. If you are looking for a relaxed lifestyle or if retirement is near, it is important to move to a place that has been established to make life simpler. Moving to Sun City means being welcomed by four square miles of golf courses, shopping, and other recreation opportunities. The area is near numerous wineries and other entertainment venues as well. For the best assistance getting your possessions to your new home, you want Meathead’s Sun City movers by your side. Sun City is a relatively small community in Riverside County with a population under 18,000. The weather is pleasant and not overly oppressive. It is a wonderful place to relax and enjoy life stress-free. Meathead Movers will make your move to Sun City easy and pain-free, all while providing five-star service at affordable prices. Our moving company specializes in local, long-distance, and commercial moves to, from, and within Sun City. We also provide reliable packing, storage, and on-site relocations. Additionally, each customer also receives a personal moving concierge service, which recommends other service providers that may be helpful. We understand that moving can be time consuming, so our Princess Packers can gather your belongings and safely wrap them, so they arrive in excellent conditions. Since we have the same crew at both ends of your move, our accountability for quality is assured. Our Sun City movers are different than any other business in the area. We are the best in the industry and offer unique features. We hire student-athletes who spend time wisely. In fact, our movers jog when not carrying your goods. When you choose us over the competition, you will not be disappointed. We hire strong, clean-cut, local students who work hard and take pride in moving your possessions. We have an extensive hiring process including criminal background checks and thorough training, ensuring your boxes are in safe hands. We also make sure our movers are drug free, so you and your family can feel comfortable spending the day around our employees. Working with us assures total satisfaction. Meathead Movers is the only moving company in California to offer a 100% satisfaction guarantee. When you are moving to Sun City, make us your first choice. Get your free no-obligation moving quote from our Sun City movers today. We will have you safely packed and on the road in no time. Moving to Sun City? Here are some helpful resources. View more Sun City resources. The professional way I was treated. They were in tune with all of my requests. The personal care they took with handling my fragile collectables. Pleasant and friendly. I really can't say enough positive things about them. I would highly recommend Meathhead movers to anyone. Thank you so much. The Kids are super friendly, helpful, fast and very respectful of my likes and dislikes of where I want to put my possessions. I will always suggest calling Meat Heads first and foremost! The guys were very efficient, pleasant...and patient with us (we don't move a lot! ), and we both appreciated that. Although there were a couple of "dings" in some of the picture frames and such, it was kept to a minimum. We do expect to move again in roughly 4 years, and the Meatheads will definitely get the call!